Gold Brittania coins from the Royal Mint. Looking for a savings account with a difference? The British Royal Mint on Monday launched an online bullion trading service in a bid to attract investors to the precious metal. Gold will now be as accessible to investors as a savings account, according to the Royal Mint. The Royal Mint's website offers several kinds of coins which customers can buy within a few minutes. The flagship "Sovereign" is a 22-carat gold coin currently selling for just over $300. 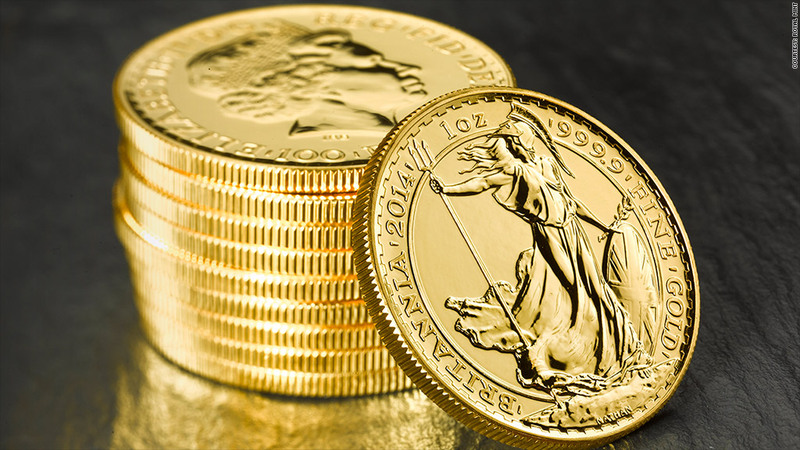 The Royal Mint says it will offer gold at the "best possible prices." It hopes to attract ordinary savers by making buying gold easily accessible. "We want to help expand the bullion market in the U.K., particularly as coins offer a relatively affordable introduction," said the Royal Mint's director of commemorative coins and bullion, Shane Bissett. Buyers can have their coins sent to their home, or -- if they buy more than 25 -- stored within the Royal Mint's vaults, which are guarded by the U.K. Ministry of Defence. The Mint said that according to the World Gold Council, the gold market could attract up to $6.5 billion in investments from the U.K. alone if it was easier to access. However, like all investments, the price doesn't always go up. Gold bars might look reassuring but their value has dropped by about 6% over the last three years. The Royal Mint has created coins for royals and governments for over 1,000 years.